Sefer Etz Hayim. Kabbalistic work compiled from the teachings of Isaac Luria by Hayim ben Joseph Vital. Sefer Etz Hayim is a kabbalistic work, compiled from the teachings of Isaac Luria by Hayim b. Joseph Vital with annotations by Jacob Tzemaḥ and Moses Zacuto, copied by Dov Ber b. Hayim. Podheitz, 1780. Hebrew / Paper / 32,6 x 19,2 cm. /  + 285 ff. 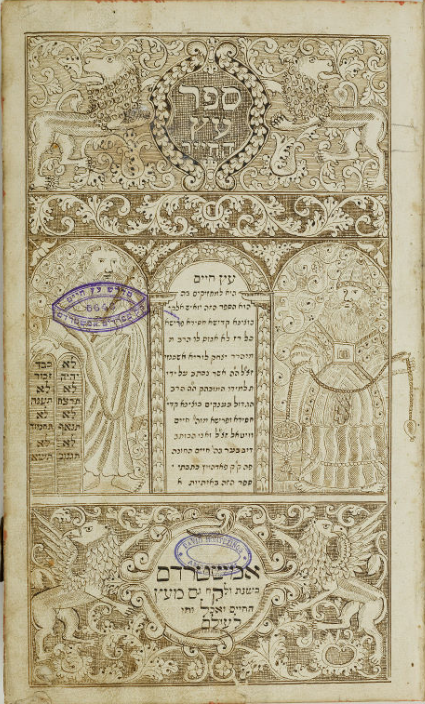 / Rabbinic cursive writing with square headings / Annotations in later Ashkenazic cursive hand in the margins / Each chapter begins with a decorated page, drawn in coloured ink / The text is abundantly adorned with abstract ornaments and figurative drawings of animals and plants / In ink, and brown and olive-green colours.